Posted by Les Bleamaster, Planetary Science Institute, Tucson, Arizona, USA. Synthetic Aperture Radar (SAR) images from NASA’s Magellan mission to Venus (science mission complete in 1994) show two distinctly different volcanic regions within only a few hundred kilometers of each other. The top image shows several relatively “small” (10’s to 100’s of kilometers in diameter, 100’s of meters in height) volcanic constructs and craters, and associated lava flows (image width ~ 500km). In contrast, the image below shows a significant portion of a 1000 km long channel-fed lava flow (image width ~ 700km). 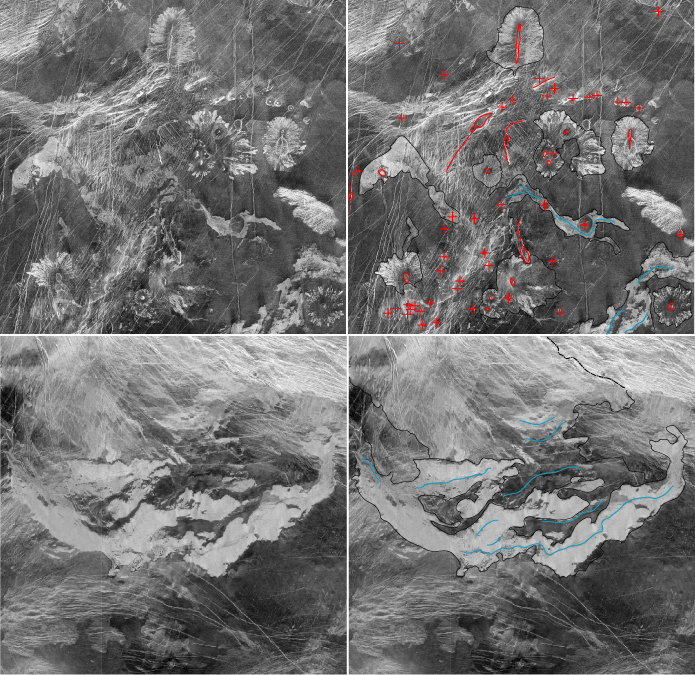 Feature maps of each area (to the right) point out the prominent flow margins (black line), summit pits and fissures (red polygons), small shields (red plus), and lava channels (blue line). Factors that contribute to the different types of volcanic landforms produced can include lava composition and temperature, magma production and the rate of lava emplacement, subsurface plumbing, and regional tectonics. Geologic mapping has determined that the lava flows from both the small constructs and long channels represent some of the youngest surface activity in the area. Correlation of this mapping with new data from ESA’s Venus Express spacecraft (operational orbit achieved in May 2006) may help to better characterize Venus’ surface volcanic features as well as reveal temperature variations indicative of active volcanism. E.B. Grosfils, J. Aubele, L. Crumpler, T.K.P. Gregg, and S. Sakimoto (2000), Volcanism on Earth’s Seafloor and Venus, in Environmental Effects on Volcanic Eruptions, eds. J.R. Zimbelman and T.K.P. Gregg (Kluwer Academic/ Plenum Publishers, New York), pp. 113-142. L.S. Crumpler, J.C. Aubele, D.A. Senske, S.T. Keddie, K.P. Magee, and J.W. Head (1997), Volcanoes and Centers of Volcanism on Venus, in Venus II, eds. Bougher, S.W., Hunten, D.M., and Phillips, R.J. (Tucson: Univ. Arizona Press), pp. 697-756.